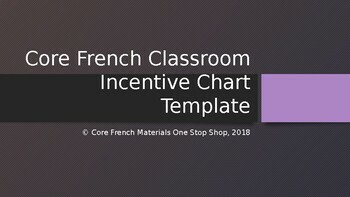 A Core French classroom chart for a Core French teacher who has more than one class. 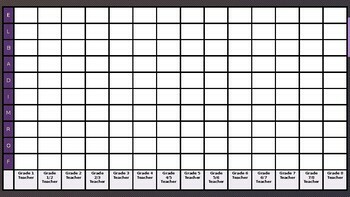 It is editable as well as can be used in a classroom as a poster if enlarged. Or made to fit onto a travel cart if you travel teach. •Delete or add columns as needed. I included 14 classrooms spots but you made need more or less. •Type in your classes into the bottom where is says class. I like to type Grade 1 Ms. ____ (so both Grade and teacher name). •Print slide 3. Enlarge if you wish. •Keep a permanent marker of colour on your cart. As students earn a box, colour it in. It will be up to your expectations what earns a box. Typically, classes should be able to earn 1 box a class. I see my classes typically 8 times a month so this means they should earn a fun class within 5-6 weeks. 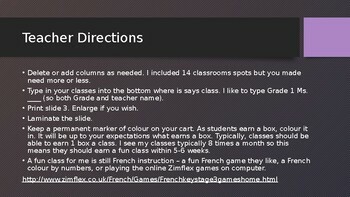 •A fun class for me is still French instruction – a fun French game they like, a French colour by numbers, or playing the online Zimflex games on computer.